*Corresponding author: Zeynep Nur Orhon, Medeniyet University, Department of Anesthesiology and Reanimation, Göztepe Training and Research Hospital, Hizirbey Cad Cüre Apt. 221/4, İstanbul, Turkey. Trauma, as it has been for many years, is still an important health problem. The use of scoring systems in Intensive Care Units [ICU]s can be predicted in terms of survival expectations by objectively evaluating the patient’s condition and the severity of the disease. In this study, the data of the trauma patients who were admitted to and followed-up in an anesthesia and intensive care unit of a training and research hospital for two years period were examined retrospectively. The demographic data of the patients, trauma scores, lengths of stay in the intensive care unit, duration of the ventilator, dietary patterns, and treatment results of the patients were recorded. It was determined that all trauma scores were associated with the duration of ventilation and mortality, and the rate of mortality increased as the APACHE II and TRISS increased and the GCS and RTS decreased. We think that these scoring systems can be used safely in-patient monitoring in intensive care units. The injuries caused by acute exposure to mechanical, thermal, electrical or chemical energies are called trauma. Trauma is an important health problem that arises due to technological developments, accidents and violence in today’s world and it has an increasing contribution to the rates of mortality and morbidity. It is commonly seen at younger ages. Most of these patients are multiple trauma cases and they constitute a significant part of the intensive care patient population. Male patients with trauma are approximately 3 times of female patients and they are mostly between 0-45 years of age. Multiple trauma concerns more than one major organ and system. In order to be able to speak of multiple trauma, the trauma should affect at least 2 regions in the human body, which are divided as head and neck, chest, abdomen and extremities. Trauma is more common at younger ages and has a strong relationship with factors such as age, gender, and region . Traumatic injury-related damage is one of the most frequent reasons for emergency care. It has been reported that 10% of deaths worldwide are due to injury and about 5 million people died in 1990 for this reason . It is estimated that this number will be 8.4 million in 2020. Trauma confronts societies with significant economic, social and health problems. This study aims to retrospectively evaluate the factors such as patient’s age, gender, type of trauma, initial Glasgow Coma Scale, APACHE II score, Revised Trauma Scores [RTS], Trauma and Injury Severity Score [TRISS], mechanical ventilation requirement and duration, and time spent in the intensive care unit, which are thought to be effective on the rates of mortality and morbidity in multiple trauma patients. In this study, the data of the trauma patients who were admitted to and followed-up in an anesthesia and intensive care unit of a training and research hospital for two years period were examined retrospectively. While investigating the condition of the patients and the results of the treatments, the main source of the data was the patient follow-up charts of the intensive care unit. The records in patient files and the hospital computer system in which patient records and information, referred to as the Probel medical information system, were used to obtain some other data. In the present study, the files of 96 patients with trauma who were registered in the patient registries in the intensive care unit were tried to be reached, but 86 patients were evaluated in a healthy manner. The ages, genders, trauma etiologies, clinical diagnoses, ways of transfer to hospital, Glasgow Coma Scale, APACHE II scores [the recorded parameters are the worst values within the first 24 hours after the patient’s admission to the intensive care unit], Revised Trauma Scores, Trauma and Injury Severity Scores, lengths of stay in the intensive care unit and duration of the ventilation, dietary patterns, and results of treatments [for those who died or survived] were recorded. The Statistical Package for the Social Sciences [SPSS] 19 program was used to analyze the data. In the analysis of the quantitative data, the conformity of the variables data to the normal distribution was evaluated by the Kolmogorov Smirnov test and the variance homogeneity by the Levene test. Parametric methods were used in the analysis of the variables with normal distribution and variance homogeneity, and non-parametric methods were used in the analysis of the variables without normal distribution and variance homogeneity. The Independent T-test, a parametric method, was used in the comparison of independent groups. The Mann-Whitney U test, a non-parametric method, was used in the comparison of independent groups, and the Spearman’s Rho test was used to analyze the correlation of the quantitative data with each other. The Pearson’s Chi-Square, Chi-Square, Continuity Correction, Fisher Exact tests were used in the comparison of categorical data. The quantitative data were expressed as mean, STD, median, and minimum and maximum values in the tables. The categorical data, however, were expressed as n and percentages. The data were analyzed at the 95% confidence level and p>0.05 was accepted to be insignificant, while p<0.05 was accepted to be significant. When the distribution of the patients was analyzed, it was seen that 69 [80.2%] of the patients were male and 17 [19.8%] patients were female. The distribution of patients by age is shown in Table 1. Distribution of the patients by the trauma etiologies is seen in Table 2. 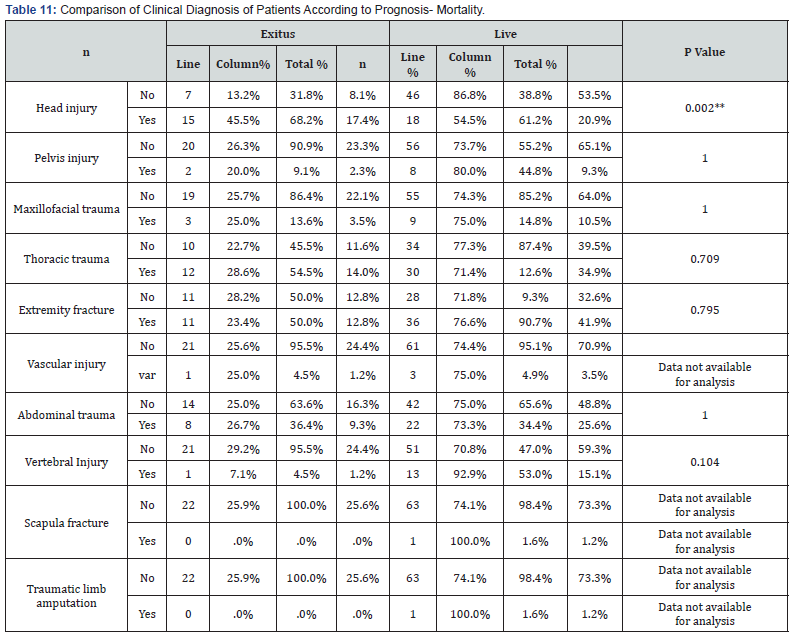 Table 3 shows distribution of the patients by the clinic diagnoses. Of the 86 patients examined, 60 [69.7%] had exposed to multiple trauma and 26 [30.2%] had single trauma. Considering the MV needs of the patients, 75 [87.2] patients needed mechanical ventilation. 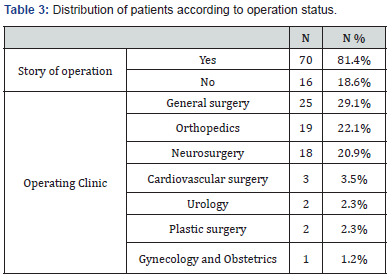 Distribution of patients by the operation status is seen in Table 4. Dietary patterns of the patients are seen in Table 5. Distribution of the patients by prognosis is seen in Table 6. Distribution of the patients by the ways of transfer is shown in Table 7. Descriptive statistics for the quantitative parameters are shown in Table 8. Age, Intensive Care Period, Duration of Mechanik Ventilation, Apache II, RTS, TRISS Parameters According to Gender are seen in Table 9. There was a statistically significant difference between the mean lengths of stay in the intensive care unit of females [4 days] and males [12 days] [p=0.003<0.01**]. There was a statistically significant difference between the mean duration of mechanical ventilation of females [3 days] and males [9 days] [p=0.044<0.05]. Distribution of genders by the prognosis and mortality is seen in Table 10. There was no statistically significant difference when genders were compared according to the rates of mortality [p=0.356>0.05]. Comparison of the etiology in terms of the prognosis and mortality is shown in Table 11. No statistically significant difference was found when the relationship between the etiologies and the rates of mortality of the patients [p=0.279]. Comparison of the patients’ clinical diagnoses in terms of the prognosis and mortality is seen in Table 12. When the relationship between head trauma and mortality status of the patients was examined a statistically significant difference was found [p=0.002<0.01**]. Comparing MV needs by prognosis-mortality is seen in Table 13. There was no statistically significant difference in terms of the relationship between the ventilation needs and the mortality rates of the patients [p=0.064>0.05]. Comparison of Patients’ Operation Status to Prognosis-Mortaliy is shown in Table 14. There was no statistically significant difference in terms of the relationship between the operational histories and the mortality rates of the patients [p=0.004<0.01**]. Comparison of the dietary patterns of the patients in terms of Prognosis and Mortality is seen in Table 15. There was no statistically significant difference in terms of the relationship between the dietary patterns and the mortality rates of the patients [p=0.287>0.05]. Comparison of the ways of transfer of the patients in terms of prognosis and mortality is seen in Table 16. When the ways of transfer and the mortality rates of the patients were examined, it was seen that the distribution of the data was not suitable for an analysis. There was a statistically significant difference between the mean duration of mechanical ventilation of those who died [10 days] and survived [7 days] [p=0.018<0.05]. There was a statistically significant difference between the mean values of APACHE II of those who died [25.43] and survived [10.97] [p=0<0.001***]. There was a statistically significant difference between the mean values of GCS of those who died [5.29] and survived [11.92] [p=0<0.001***]. There was a statistically significant difference between the mean values of RTS of those who died [4.2607]and survived [7.0090] [p=0<0.001***]. There was a statistically significant difference between the mean values of TRISS of those who died [29.3] and survived [52.5] [p=0.004<0.01**]. Correlations of the Age, Length of stay in the ICU, MV Duration, APACHE II, GCS, RTS, and TRISS Parameters with each other. The relationship between age and the APACHE II score was statistically significant [p=0.026<0.05*]. There was a statistically significant relationship between the length of stay in the ICU, duration of mechanical ventilation, APACHE II, Glasgow Coma Scale, Revised Trauma Score, and TRISS [p=0.005<0.01**]. The relationship between the duration of mechanical ventilation and APACHE II, Glasgow Coma Scale, revised trauma score, and TRISS was statistically significant [p=0.001<0.001***]. There was a statistically significant relationship between the Apache II and Glasgow Coma Scale, Revised Trauma Score, and TRISS [p=0.00<0.001***]. The relationship between the Glasgow Coma Scale and Revised Trauma Score and TRISS was statistically significant [p=0.00<0.001***]. The relationship between the Revised Trauma Score and TRISS was also statistically significant [p=0.00<0.001***]. Trauma is an important health problem that may lead to disability and death, which is constantly increasing due to advances in the industry and technology. Traffic accidents have the highest rate of trauma-related death cases in our country. Since the cases of trauma affect mostly the young population, it causes labor loss, and psychological, social and economic problems. Since multi trauma involves more than one system, patients should be followed up in intensive care conditions to reduce the risk of morbidity and mortality. When the information of 86 trauma patients, who were admitted to the intensive care unit and received treatment and who had access to the file, were examined, it was determined that the number of young and productive sectors between the ages of 15-45 was quite high. This finding is supported in various studies carried out in our country [3,4]. The incidence of accidents in the groups over 46 years of age has declined. Of the patients, 69 [80.2%] were male and 17 [19.8%] were female. Investigations made show that the general body traumatic cases are predominantly male. It was seen that 68.4% of the general body traumatic patients were male in a study conducted at Uludağ University, however, this rate was 67.4% in a study conducted in GATA [5,6]. In the study by Neklapilova & Zelnicek , 57.5% of the traumatic patients were male, while this rate was 71% for the traffic accident-related traumatic patients in the study by Sözüer et al. . In the study by Tomas et al. conducted in the age group of 0-15 years, 62% of 79 multiple trauma patients, 77.2% of whom had a traffic accident, were male. Our data is compatible with the literature. The reason why trauma is very common at a young age is often considered as gender, age and social approaches . Among the departments where patients are admitted to the intensive care unit, the general surgery department comes first with a rate of 29.1%. This is followed by the orthopedics department with a rate of 22.1%, and the neurosurgery department with a rate of 20.9%. A retrospective study of 1109 patients treated at the reanimation unit at Uludağ University found that patients were taken to the intensive care unit mostly by the neurosurgery department [19.7%]. In a study of general body traumatic patients conducted at Cumhuriyet University, it was seen that patients were taken to the intensive care unit mostly by the orthopedics department [34.2%], and this is followed by the department of neurosurgery [23.4%] . 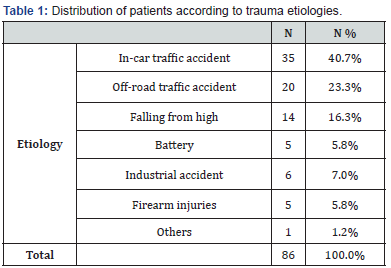 When 86 patients were examined in terms of their trauma etiologies, it was seen that the most common causes of trauma were the inside the vehicle traffic accidents with 35 patients [40.7%], off road traffic accidents with 20 patients [23.3%] and falling with 14 patients [16.3%]. In the studies by Miller et al. & Adeloye et al. , were reported that traffic accidents were the most common cause of trauma. 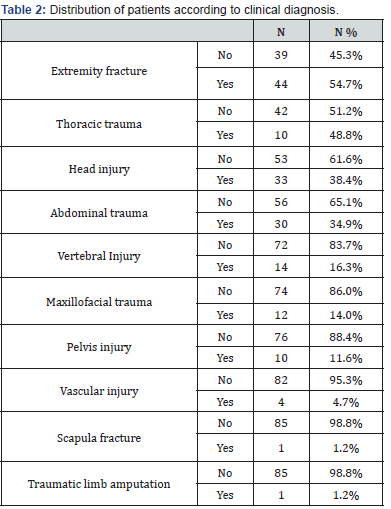 When 86 trauma patients were evaluated in terms of clinical diagnosis, the most common diagnosis was the extremity fracture with 47 patients [54.7%]. In the study by Otte et al. it was seen that 69.6% of the multiple trauma patients had the head trauma, 69.2% had the chest injury, 51.9% had the abdominal injury, and 33.1% had other injuries. Aharonson-Daniel et al. reported a head trauma in 60% of the cases from traffic accidents. In the present study, it was seen that the lengths of stay in the intensive care unit varied between 1 and 110 days and the median value was 5 days. There was no significant relationship between the lengths of stay in the intensive care unit and the age groups. Frindlay et al. examined the data of 774 patients admitted to the intensive care unit in 2 years and found that the lengths of stay in the intensive care unit varied between 1 and 68 days and the median value was 2 days . They saw that there is no significant relationship between the lengths of stay in the intensive care unit and the ages of the patients and obtained results like those in the present study. Of the 86 patients investigated in this study, 39.5% had the lengths of stay in the intensive care unit of 1 to 3 days. The rate of those stayed in the intensive care unit for more than 14 days was determined as 25.5%. In a study of 4651 patients by Render et al. , the mean length of stay in the intensive care unit was 3.1 days . Weissman et al. determined that the total lengths of stay in the intensive care unit of 6571 patients followed up in an 8-year period varied between 1 to 147 days and the median value was 2 days . Grenrot et al. found the mean length of stay in the hospital of 143 intensive care patients as 8.6 days, and when they compared the trauma cases with other disease groups, they found that the trauma cases had two times higher lengths of stay in the intensive care unit . 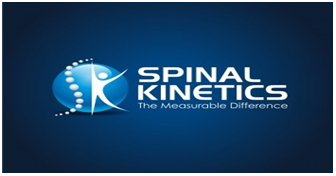 In the present study, the mean APACHE II of 86 patients was 14.67±8.95. A significant relationship was found between the APACHE II score and the duration of mechanical ventilation [p<0.001]. The duration of mechanical ventilation increased as the APACHE II values of the patients increased. In a study by Sencan et al. , patients with the APACHE II values of 12.55±8.2 were determined to have long mechanical ventilation durations . Lee & Tai  showed that the APACHE II score was in concordance with the duration of mechanical ventilation . Glasgow Coma Scale (GCS) was developed by Teasdale & Jannett  to evaluate the severity and depth of a head trauma in 1974 . In the present study, it was seen that as the GCS value of the patients increased, their duration of mechanical ventilation decreased (p<0.05). Akyıldız et al. found that the duration of mechanical ventilation of patients with higher GCS values were lesser than those of patients with lower GCS values . The Revised Trauma Score provides a high observation and conformity ratio in estimating the mortality risk and associating it with the survival. It is one of the most important scoring systems in showing the survival ratios even when they are used alone . A significant relationship was found between the RTS values and the duration of mechanical ventilation of the patients [p<0.001]. Accordingly, it was seen that as the RTS values of patients increased, their duration of mechanical ventilation decreased. TRISS, however, an anatomical and physiological scoring system which is better in determining the possible survival ratio. It can be useful in estimating the survival according to the RTS, ISS, age and whether it is a penetrating or blunt trauma . A significant relationship was determined between the TRISS mean values and the duration of mechanical ventilation [p<0.001]. It was seen that as the TRISS value of the patients increased, their duration of mechanical ventilation extended. The nutritional support is needed because of the hyper catabolism and hypermetabolism occurring as a stress response to trauma in the early period in patients with severe trauma . The endogenous protein degradation is inevitable if this increased energy requirement cannot be substituted with external support. Even though the patient is previously well-fed, the obligatory protein cycle will continue by using the visceral proteins at the expense of immune defense and will provide the basis for a Multiple Organ Failure [MOF] . In the present study, 48.8% of the patients were fed by the enteral method, 14% with the parenteral method, 17.4% by the oral route and 5.8% with the combined method, and no feeding method was applied in 14% of the patients. Patients who were not fed were the patients who underwent surgery due to trauma and transferred to their wards after being followed up in the intensive care units for 1 or 2 days, and/or those who were not suggested to be fed because of surgical reasons. The infection agents leading to multiple organ dysfunction comes from the gastrointestinal system. Therefore, antacid regimen, oral nystatin administration, and enteral nutrition combinations are recommended as the strategies to prevent mucosal barrier breakdown and translocations . If the gastrointestinal system is unusable and nonfunctional, an indication arises for the parenteral nutrition . In this study, it was seen that 22 of 86 patients died [25.6%]. When the rates of mortality were evaluated in terms of age, it was seen that the rate of mortality was 31.7% in the age group of 0-45 years, and 46.8% in the group of 60 years and over. Varol et al. determined the highest mortality in the age group of 0-14 with a rate of 24.4%, which was followed by the age group of 50-59 with a rate of 17.1% . In a study conducted on the intensive care units in the United States, the data of 2693 patients were reviewed, and it was similarly determined that the rate of mortality increased with the advanced age . In this study, 16 [72.7%] out of 22 patients who died were male and 6 [27.2%] were female. In a study conducted on the mortality rate in the intensive care unit, Günal et al. determined the rate of male/female mortality rates as 64%/36% . The reason why trauma and traumatic deaths are more common among males may be related to the etiology of trauma. The in-car traffic accident is the most frequently seen cause of trauma and is followed by the off-road traffic accident. There are significant differences between the genders in terms of getting involved in accidents. It can be said that female drivers are less involved in accidents because their numbers are less than male drivers and the behavioral characteristics of women are different from men. In the present study, when the rate of mortality was examined according to the APACHE II scoring system, it was seen that the mean APACHE II score of the patients who survived was 10.97±5.47, while the score of the patients who died was 25.43±8.47. There was a statistically significant relationship between the APACHE II values and the rates of the mortality of the patients (p<0.001). In a study conducted on the intensive care patients, Ulus et al. found that the APACHE II score of the patients survived was 25.2±7.9, while the score of the patients who died was 30.4±7.1 . In a study of 5815 intensive care patients, Knaus et al. found that the APACHE II score was 20-35 and the rate of mortality was 40- 75% in all non-operative patients . In the present study, it was seen that the mean Glasgow Coma Score of the patients who survived was 11.92±3.3, while the score of the patients who died was 5.29±3.62. There was a statistically significant relationship between the mean GCS values of the patients and the mortality [p<0.001]. It was determined that the rate of mortality increased as the GCS values of the patients decreased. It was seen that the possibility of being discharged increased as the GCS values increased. In a study of 1390 patients who were followed up and treated in intensive care units during a four-year period, Teoh et al. found a significant relationship between the GCS and the rates of mortality . The trauma score began to be used in 1980 and was renewed with the Revised Trauma Score, a scoring system that shows physiological injury, being added in 1981 . In the patient group investigated in this study, the mean RTS value of the patients who died was 4.26±1.4, while it was 7.00±0.93 for the patients who survived. There was a statistically significant relationship between the mean RTS values of the patients and the mortality [p<0.001]. In a study of multiple trauma patients conducted at Dicle University, deaths were seen when the RTS was under 6.2 and the mean RTS values of the patients who died was found as 2.86±2.53 . Eryılmaz et al. determined that the mean RTS value was 6.0±2.7 for patients who survived and as 2.1±2.1 for patients who died . Since the RTS identifies the physiological and ISS [Injury Severity Score] identifies the anatomical aspects of an injury, Champion et al. created the TRISS method considering that the combined use of these two would better show the possibility of survival. This method was determined with the addition of RTS, ISS, and age . In the present study, the mean Trauma Injury TRISS values were 52.5±33.8 for the patients who survived and 29.3±29.6 for the patients who died. There was a statistically significant relationship between the mean TRISS values of the patients and the mortality [p<0.001]. In a study by Eryılmaz et al. , the TRISS values were 20.4±23.9 for patients who survived and 87.9 ± 11.4 for patients who died . The results of our study show that trauma scoring systems are effective in determining the general condition and mortality of patients. Measures to be developed with this one and similar studies considering the epidemiological characteristics of a trauma will be helpful in reducing trauma-related morbidity and mortality. It is also believed that these measures may contribute to reducing the economic and social losses of the community, raising awareness of the group at risk, and the statistical information about the trauma. There is no conflict of interest exists. Minino AM, Heron MP, Smith BL (2006) Deaths and death rates for the 10 leading causes of death in specified age groups: United States, preliminary 2004-Con. Nat Vital Stat Rep 54: 28-29. Eachempati SR, Reed RL, St Louis JE, Fischer RP (1998) “The Demographics of Trauma in 1995” Revisited: An Assessment of the Accuracy and Utility of Trauma Predictions. J Trauma 45(2): 208-214. Ural G, Gün İ, Nafiz körfez Sincan Devlet Hastanesi ve Özel Bayındır Hastanesi Acil Servisine kaza nedeniyle başvuranların epidemiyolojik yönden incelenmesi. Sağlık Bilimleri Dergisi (Journal of Health Sciences) 2008: 17(1): 31-39. Varol O, Hakan S, Oguztürk H, İlhan Korkmaz, İnan beydilli et al. (2006) Acil servise trafik kazası sonucu basvuran hastaların incelenmesi. CÜ Tıp Fakültesi Dergisi 28(2): 55-60. Türkmen N, Akgöz S, Çoltu A et al. (2005) Uludağ Üniversitesi Tıp Fakültesi Acil Servisine başvuran adli olguların değerlendirilmesi. Uludag Üniversitesi Tıp Fakültesi Dergisi 31(1): 25-29. Ceylan S, Tümerdem N, Yasar M, et al. (2000) GATA Egitim Hastanesi İlk ve Acil yardım merkezine başvuran hastalardan yatırılarak tedavi edilenlerin vehastalıklarının bazı özelliklerinin belirlenmesi. GATA Eğitim Hastanesi Dergisi 7: 23-27. Neklapilova V, Zelnicek P (2003) Epidemiology of Severe Injuries from the Viewpoint of the Trauma Center. Cas Lek Cesk 142: 676-678. Sözüer EM, Yildirim C, Senol V (2000) Trafik kazalarında risk faktörleri. Ulusal Travma ve Acil Cerrahi Dergisi 6(4): 237-240. Tomas E, Navascues JA, Soleto J, Sánchez R, Romero R et al. (2004) Events related with injury severity in pediatric multiple trauma. Cir Pediatr 17(1): 40-44. Özyurt G, Şahin S (1989) Reanimasyon ünitesinde yillari arasinda tedavi edilen hastaların analizi. Türk Anesteziyoloji ve Reanimasyon Cemiyeti Mecmuasi 17: 161-163. Miller WJ (1995) Accidents in Canada 1988 and 1993. Health Reports 7(2): 7-17. Adeloye A, Ssembatya Lule GC (1997) Aetiological and epidemiological aspects of acute head injury in Malawi. East African Medical Journal 74(12): 822-828. Otte D, Pohlemann T, Wiese B (2003) Changes in the Injury Pattern of Polytraumatized Patients Over the Last 30 Years. Unfallchirurg 106(6): 448-455. Aharonson Daniel L, Boykov V, Ziv Avitzour MP (2003) A New Approach to the Analysis of Multiple Injuries Using Data from a National Trauma Registry. Inj Prev 9(2): 156-162. Frinlay JY, Plenderleith JL, Schroder DR (2000) Influence of social deprivation on intensive care outcome. Intensive Care Med 26(7): 929- 933. Render ML, Welsh ED, Kollef M, Lott JH, Hui S, et al. (2000) Automated computerized intensive care unit severity of illness in the department of veteran’s affairs: Preliminary results. Crit Care Med 28(10): 3540- 3546. Weissman C (2000) Factor influencing changes in surgical intensive care unit utilization. Crit Care Med 28(6): 1766-1771. Grenrot C, Norberg KA, Hakansson S (1986) Intensive care of the elderly-a retrospective study. Acta Anesthesiol Scand 30: 703-708. Şencan A, Adanır T, Aksun M, Karahan Nagihan, Aran Gülçin (2009) Yoğun bakıma kabul edilen akut zehirlenme olgularında bireysel ve etiyolojik özelliklerin mortalite ile ilişkisi. Türk Anest Rean Der 37(2): 80-85. Lee P, Tai DY (2001) Clinical features of patients with acute organophosphate poisoning requiring intensive care. Intensive Care Med 27(4): 694-699. Teasdale G, Jennett B (1974) Assessment of coma and impaired consciousness: A practical scale. Lancet 2: 81-84. Akyildiz B, Uzel N, Çitak A, Demet Soysal, Metin Karaböcüoğlu et al. (2008) Meningokoksemik hastalıkta mortaliteyi etkileyen faktörler. Çocuk Sağlığı ve Hastalıkları Dergisi 51(1): 26-30. Roorda J, Van Beeck EF, Stapert JW (1996) Evaluating performance of the Revised Trauma score as a triage instrument in the prehospital setting. Injury 27(3): 163-167. Fedakâr R, Aydıner AH, Ercan I (2007) A comparison of “life threatening injury” concept in the Turkish Penal Code and trauma scoring systems. Ulus Travma Acil Cerrahi Derg 13: 192-198. Kudsk KA, Stone J, Sheldon GF (1981) Nutrition and trauma. Surg Clin North Am 61: 671-677. Cerra FB (1987) Hypermetabolism, organ failure, and metabolic support. Surgery 101(1): 1-14. Moody FG, Clabuig RL (1990) Billary and gut function following shock. J Trauma 30(12): 179-188. Moore FA, Moore EE, Jones TN, McCroskey BL, Peterson VM (1989) Ten versus TPN following major abdominal trauma-reduced septic morbidity. J Trauma 29(7): 916-925. Varol O, Hakan S, Oguztürk H (2006) Acil servise trafik kazası sonucu basvuran hastaların incelenmesi. CÜ Tip Fakültesi Dergisi 28(2): 55- 60. Champion EW, Mulley AG, Goldstein RL (1981) Medical intensive care for the elderly. Jama 246(18): 2052-2056. Günal H, Çalısır HC, Savkılıoğlu E (2003) Solunumsal Yoğun Bakım Ünitesinde APACHE II, III ve Mortaliteyi Belirleyen Diğer Faktörlerin Değerlendirilmesi. Yoğun Bakım Dergisi 3(1): 48-54. Knaus WA, Draper EA, Wagner DP, Zimmerman JE (1985) APACHE II: A severity of disease classification system. Crit Care Med 13(10): 818- 821. Teoh LSG, Gowerdman JR, Larsen PD, Green R, Galletly DC (2000) Glasgow coma scale: variation in mortality among permutations of specific total scores. İntensive Care Med 26(2): 157-161. Moris JA, Auerback PS, Marshall GA, Bluth RF, Johnson LG, et al. (1986) The trauma score as triage tool in the prehospital setting, JAMA 256: 1319-1325. Yagmur Y, Güloglu C, Ugur M et al. (1997) Multitravmali hastalarin degerlendirilmesi, Yaralanma siddeti skoru ile revize edilmis travma skoru’nun karsılastırılması. Ulusal Travma Dergisi 3(1): 76-78. Eryilmaz M, Durusu M, Cantürk G, M Öner Menteş, M Tahir Özer et al. (2009) Adli olgularda anatomik ve fizyolojik travma skorlama sistemlerinin rolü. Ulus Travma Acil Cerrahi Dergisi 15(3): 285-292. Osler T (1993) İnjury severity scoring. Perspectives in Development and Future Directions. The American Journal of Surgery 165: 43-51. Eryılmaz M, Durusu M, Mentes Ö, Tahir Özer, Selim Kiliç et al. (2009) Comparison of Trauma Scores for Adults Who Fell from Height as Survival Predictivity. Turk J Med Sci 39(2): 247-252.